Here's a trip down memory lane for New Year's Eve. Tonight I cropped this image out of a photograph that I took in Chicago in January of 1979, when we lived on the North Shore in Rogers Park. 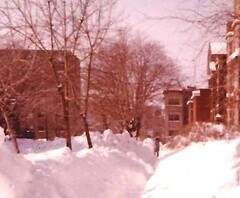 It all started with a blizzard on New Year's Eve, which was followed by storm after storm each day until the tops of cars were covered (we couldn't dig out for six weeks) and what had been sidewalk was reduced to little narrow paths like the one in this photo. Well, 1978 was a long time ago, and I have seen a lot of snow storms since then. I have been in blizzards in Colorado, in Kansas, in Minneapolis, in New Jersey, and in Boston -- but I have never seen a city as paralyzed by snow as Chicago was that year. 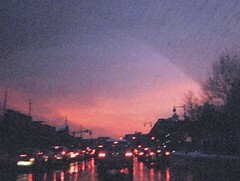 The blizzard has become legendary, hence the nostalgic pastel colors in the photo. As I looked in my albums to find this picture, what surprised me the most was that I didn't take more pictures! I guess it took me some time to learn to see snow as an opportunity to make art, rather than just an obstacle or an inconvenience. Tonight I drove to Boston with Heather to the Museum of Fine Arts. 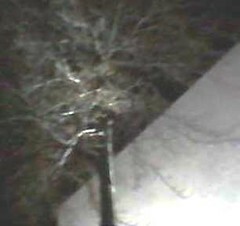 At we walked into the museum, I admired the trees near the entrance, back-lit against a white wall. But we were rushing. We needed to grab something to eat, then catch the exhibit on cubism before our assigned entry time to the Ansel Adams exhibit. So I didn't stop to take a picture. Both exhibits were amazing, amazing, amazing! (For me, a really great art show makes me eager to make art myself as soon as I get home!) Anyway, it was getting late when we left the MFA, but when we passed those back-lit trees again, I took a quick picture with my phonecam. After I loaded the image into my computer, I adjusted the contrast and cropped the image to improve the composition. And here it it. It was warmer than usual today, in the forties, and the rain was dissolving what was left of the snow. When I have a busy day like today, it often seems unlikely that I will have a chance to make art. 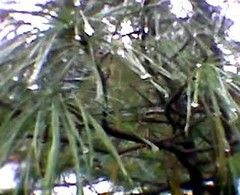 But as I was coming back from an errand, I noticed the raindrops on the pine needles. They looked like blown glass! So I took some quick pictures with my phonecam. Later I opened the images in my computer. The best image was this one, but there was a problem: in the background some dead leaves were caught in the branches, and although I liked the burnt orange color, those leaves distracted attention from the pine needles and wreaked havoc with the composition. So I opened the image in Painter IX and used some digital chalk, very light and transparent, to make the color more neutral. Then I cropped the image and adjusted the contrast a bit to try to bring out the beauty of the raindrops and the pineneedles. None of this took very long. But it is a good reminder that just when I think I can't find time to make art, it finds me! Sometimes when I am shoveling snow, I take pictures. I love the way snow looks and even more, I love the way snow makes us look, and look harder. 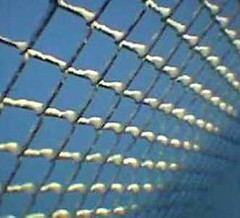 After one of our recent snow storms, I took this picture with my phonecam of the patterns of snow on the fence. This photo had an interesting angle, so tonight I cropped it just a bit to emphasize the geometric of the fence and the patterns made by the snow. 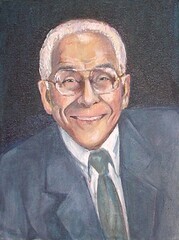 This is the latest version of the portrait I am painting for my friends. Last night I modified the eyebrow shape and color, narrowed the bridge of the nose, and added depth to the eyes by darkening the iris. I also put a transparent layer of Payne's gray over the jacket to even out the color. The changes I am making now are small, but I think they make a difference in creating a likeness. There are just a few small changes left to make. . . .
Tonight I cropped this image out of a photo I took in Edinburgh two years ago on December 26, which is Boxing Day. I had never been aware of Boxing Day before, but I certainly became aware of it during our trip because our plan to travel to Belfast was delayed because the ferry doesn't run on Boxing Day. So we decided to explore Edinburgh. Our delay turned to be a wonderful unplanned detour. 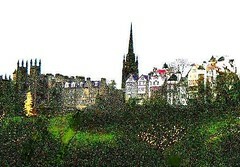 This image of Edinburgh has been digitally modified (tinted and adjusted in Painter IX to add color and clarity), which is why I call it a fantasy. But any picture of Edinburgh on Boxing Day would seem like a fantasy, with quaint little houses, castles, spires, and sparkling lights on the hillside. 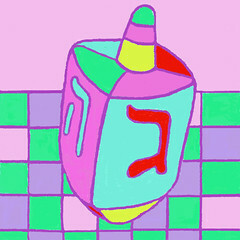 I made this little dreidel several years ago, not out of clay but out of pixels, using my very first Painter program. In fact, this was one of my first attempts at digital art. I sent this image to friends and family with my e-mail Chanukah greetings, and I plan to do so again this year. Because Chanukah starts tonight, I decided to post this image on my blog. But first I needed to clean it up, so I pulled it into Painter IX and did a little polishing with digital chalk. Now I think it is ready for a spin, so here it is. 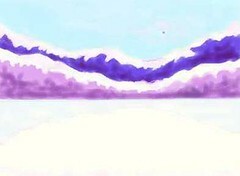 Today I drew this image of the Colorado mountains from memory and imagination. This is an image of the Front Range of the Rocky Mountains, which you see when you are driving between Denver and Pueblo. I created this image on the computer with Painter IX's digital chalk to use as a holiday greeting. It's time for another picture of Portugal. It is nice to look at images of bright sunshine and colorful flowers in the midst of a Massachusetts December. Here's is one I took a few years ago during a visit to Portugal in July. 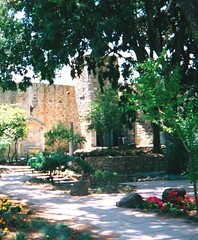 This is from a photo I took in the garden at the Castelo de Sao Jorge in Lisbon. I cropped the image to improve the composition and also adjusted the contrast to try to capture the beautiful dappled light. Tonight I cut up a fresh pineapple for dinner. I like to eat pineapple in winter, partly because It's comforting to remember that it is warm and tropical SOMEWHERE! 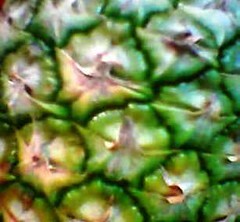 I used my phonecam to take this picture because I think the pattern of the pineapple is beautiful too! Cutting up a fresh pineapple is a challenge. In fact, in Portuguese, the word for pineapple ("abacaxi") is also used to describe a problem so difficult and complicated that it's hard to know how to begin. If you want to eat fresh pineapple, you will need a little optimism, but the reward is sweet! Tonight I cropped this detail out of a picture from my visit to London, which was just about two years ago today. Mel met me at Heathrow and we spent a few days exploring London before heading north to Scotland to catch the ferry to Belfast. 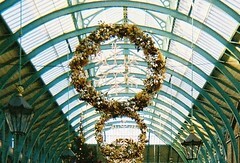 I really enjoyed London, and Covent Gardens was one of my favorite places. I am only a spectator when it comes to Christmas celebrations, but London offered an ideal view. At Covent Gardens, they were serving tiny mince pies and little cups of hot mulled wine, and at that point, I wouldn't have been surprised to see Charles Dickens appear in the crowd. It's hard to capture London in a photograph, but this image brings back some nice memories. 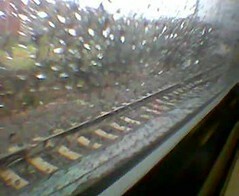 I took this picture with my phonecam a few weeks ago on the train, heading from Boston to New York to visit my aunt. It was pouring rain, but I was so happy to be making the trip that I didn't mind. Not that I had much of a chance to get wet. I walked out my back door, down the alley and around the fence to catch the commuter rail to Boston. At Boston's North Station, I caught the "T", and after a few stops on the Green Line, changed to the Red Line and arrived at South Station with enough time for coffee and a muffin before catching the Amtrak to NYC. By the time I arrived at New York Penn Station, it was sunny. Right in Penn Station, I caught the subway and rode uptown to the stop for my aunt's place, then got off and walked the three blocks to her new apartment. "That was so easy," I said when I saw her. "We're practically neighbors now! I only had to walk a few blocks to get here." This morning I decided to walk at the mall for exercise, just as a change of pace. 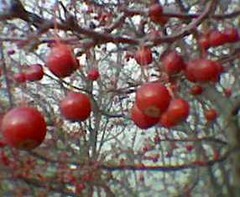 On the way into the mall, I noticed this tree, with red berries hanging from the branches. It looked so pretty that I took a picture with my phonecam. It was nice to have this quiet moment of reflection outside the mall. I wish I had used the time to reflect on the date, because once I got inside the mall, it was a madhouse. Today we had a phone call from a good friend from Chicago. He and his family were also our neighbors when we lived in Rogers Park and taught at Loyola University of Chicago. So tonight, I found this photo that I took in back 1979. (The photo is carefully labeled "January 1979 pre-blizzard," because a few weeks after this photo was taken, Chicago was hit with a record-breaking, history-making, car-burying, mayor-retiring snowstorm.) 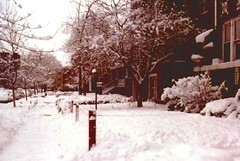 I scanned the image in the computer tonight, then cropped it to remove the rounded 1970's photo corners, and adjusted the color to tone down a pink cast, just enough to capture the whiteness of the snow. But I left a bit of the pink, because I liked the effect, almost like sepia tones. I often say that no matter how cold it is in Boston, you don't know from cold until you have lived in Chicago. But we had warm friends and great times there, and will always have good memories of a terrific city. Last Saturday, we drove one of our Belfast visitors to Logan Airport so she could catch her plane back to Northern Ireland. It was a snowy, slushy day and it was around four PM, so there was traffic. But the sky was amazing, so I took a picture, thinking that later I would crop out the cars, the windshield, etc. But looking at the image tonight, I decided to use the reflections of the car lights and the arc made by the windshield wiper as part of the composition. The frustration of slow-moving traffic can make us "see red". But if we just calm down and enjoy the opportunity to really look, we can see a lot of other colors, too. This is a quick sketch that I did tonight at the computer, using digital chalk in Painter IX. 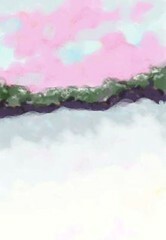 This is drawn from my imagination, but inspired by the muted colors and soft outlines and amazing sunsets of winter. Once in a blue moon, you see a sky this beautiful. 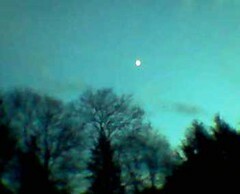 I recently took this picture with my phonecam and tonight cropped the image to improve the composition. A lot can happen between sunrise and sunset, even on an ordinary day. And every day has problems and challenges, but if we remember to look, we can see that good things happen everyday, not just once in a blue moon. 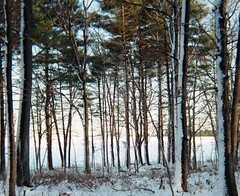 Here in Massachusetts, January seems to have arrived in December. It is too early to have the kind of snow and cold temperatures we are having this week. But when it is warm enough, we take the dogs for short walks, sometimes walking in nearby wooded areas to avoid the heavy salt on the sidewalks. Besides, the dogs like the adventure of it. . . . Here is a picture I took last week on one such walk. Tonight I cropped the image to improve the composition. Today I had a chance to work on this portrait that I am painting for my friends. I adjusted the angle of the eyes and modified the hairline a bit. In addition to some other small changes on the face, I changed the position of the tie and made the tone of the jacket more even. 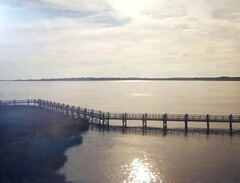 This is a photograph that I took from the train on my recent trip to New York. I edited this picture tonight from film I just had developed. I decided to post this because two of our Irish visitors took the same train today from Boston to go to New York City. I told them to be sure to sit on the left-hand side to catch the coastal views. Despite the amazing scenery, it was a challenge to get a good pictures from the train. The train windows darken the image, not to mention my pesky flash which decided to go off whether I wanted it to or not.) So it took some editing to salvage this picture. But I like the composition and the effect of the muted colors. Mel and I have been spending some time with our visitors from Belfast. Today we met two of them in Cambridge, and then drove into Boston, snapping photos all the way. 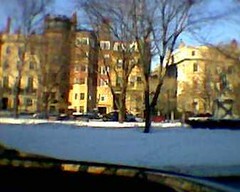 We got stalled in traffic on Commonwealth Ave. Ciaran said that we were "moving at the speed of erosion", and we took advantage of the fact to take more pictures. But by this time, it was hard to see through the car windows, which had been sprayed with slush on the streets of Boston. So we decided to open the sunroof and try taking pictures that way. 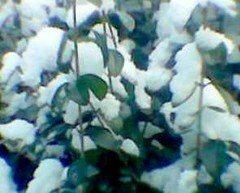 That is how I took this picture with my phonecam. Later, I tried to edit the photo on my computer (rotating and cropping), but I decided that I prefer the original, not only because the image is clearer, but because this version preserves the crazy way the photo was taken, and captures the fun we had today. This morning there was a lot of snow to shovel, but it was sunny, not too cold, and there wasn't a cloud in the sky. 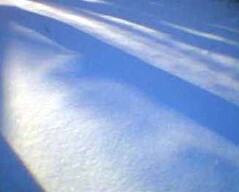 The morning light cast long blue shadows on the snow. As I shoveled, I stopped to take pictures. Tonight I edited them, and this is my favorite of the bunch. Today's weather forecast was for a bad snow storm. This morning, I shoveled what turned out to be several inches of snow just before the snow turned to rain. I thought (and the folks on the radio seemed to think) that we were all done with snow for the day. 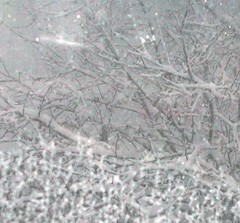 So I was quite surprised when I looked out the window around 3 PM to see heavy snow, near whiteout conditions at times. I took some pictures with my digital camera and edited them tonight. I had to get the contrast just right to make it possible to see the snow on the branches, the snow blown against the window, the falling snowflakes, and the headlights of the cars creeping along the street. Here is the image I like the best. 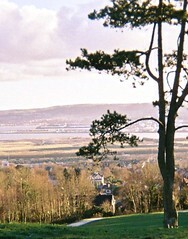 This is a view of Belfast from a distance, from a photo taken at Belfast Castle. Tonight I cropped this image to post in honor of two friends from Belfast who are visiting. We picked them up at Logan Airport today and drove them up to New Hampshire for a party with Mel's UNH colleagues. Distance gives you a new perspective on a place, whether that is a place you have visited or a place you call home, and it was interesting to get our friends' perspectives on visiting the US. Although my visits to Belfast were shorter than I would have liked, looking back, it seems that those visits, however short, were long enough for me to feel connected to the place and to the great people I met there. 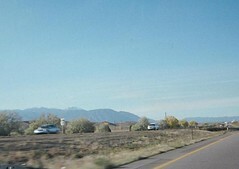 This is a picture of the scenery between Pueblo and Colorado Springs. I cropped this image from a photo I took during a visit to my home state. You can see the arid landscape in the foreground and the blue mountains in the distance. I still feel very connected to friends and family from home, and Colorado has influenced me in many ways, from my attitudes to my art to my cooking. I am posting this tonight because I am doing some Colorado cooking, making green chili (a recipe from Pueblo) to take to a pot-luck up in New Hampshire tomorrow. I hope they'll be ready for those jalapenos! It's time for another picture of Portugal. This image began with a photo that I took on a visit to Porto two years ago. I remember being interested in the geometry of the composition, the strong lines of the church and the long diagonals of the building on the left. Tonight I edited the image. In the original photo, you can see a line of cars parked on the opposite side of the street, so I began by cropping those out. Then I opened the image in Painter IX and added some color with digital watercolor, for the most part using more intense versions of colors that were already present in the picture. 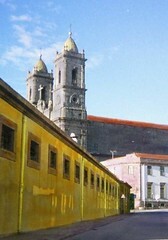 I call this a fantasy because the image is digitally modified, but this is really the way Porto looks to me. Today we had the first snow of the season that really covered the sidewalks and didn't melt within an hour. Instead of going to the gym, I went outside to shovel. Although I often shovel for usual practical reasons, I also shovel for the exercise. I love the way the snow looks before it has been disturbed. My reward for shoveling is a chance to play in the snow, which (as my dogs remind me) is great fun. 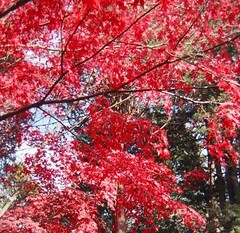 It also gives me a chance to take photographs. Here's one I took this morning with my phonecam when I looked up from shoveling and found myself nose to nose with the hedge. 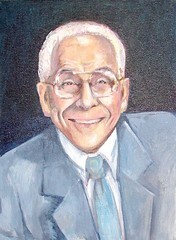 Today I had a chance to work on this portrait that I am painting for my friends. I made several small changes, concentrating mainly on the smile, trying to capture the same expression as in the photograph I am using as a reference. It's December already! (How did that happen?) I took this picture just a few weeks ago, but by now almost all the trees have lost their leaves up here north of Boston, and the temperature is dropping. It feels like it's almost time for snow, serious snow, and I am still trying to re-adjust to the cold weather. Winter has its own beauty, which I intend to enjoy as much as possible. But first, just one last look back at the gorgeous color of autumn. 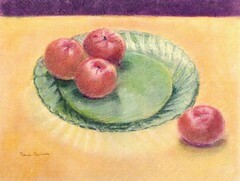 This is a pastel that I did a few years ago of clementines on a green glass plate. While I was in New York, my aunt and I walked over to Broadway and bought some clementines in one of those tiny New York grocery stores with beautiful fruit and flowers stands on display outside. At my cousin's suggestion, we picked up some clementines, and later, my aunt and I ate them on her new red plates in her new apartment. Back home today, on impulse I bought some clementines at the grocery store here in Beverly. Clementines make up in flavor what they lack in size, so I am posting this pastel as a reminder of a visit that was very short but very, very sweet. 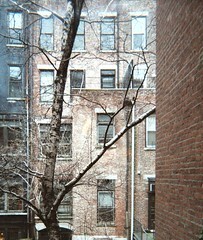 Here's one of my favorite views of New York City, from the back window of my cousins' apartment (which is one of my favorite places to go in Manhattan).